You may be wondering if tra﻿﻿mpolines are a﻿﻿ good workout, and perhaps you have asked yourself this question. The best mini trampoline for adults is definitely out there, but sometimes it takes a bit of time to find the right one, which just may be the Stamina 36 inch Folding Trampoline. 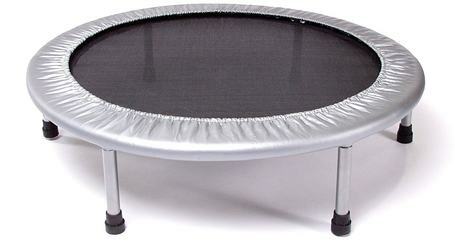 The Stamina trampoline is effective and safe, and it can be carried around with you because of its compact size. 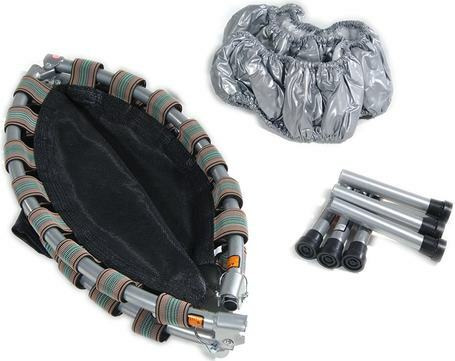 It only weighs 14 pounds, and it can hold up to 250 pounds of weight. The trampoline is 36 inches around, and it is rugged: it's made of all-steel, and the legs are detachable for easier storage and carrying. The surface is heavy-duty, too, and the rebounding surface even has a safety pad. This trampoline has thirty-band tension resistance, and each band is about two inches wide, so you can be sure of reliability and durability. The trampoline includes a limited manufacturer's warranty, and this means the frame is warrantied for one year and the parts for 90 days. This trampoline can hold up to 250 pounds of weight, so even a larger person can use it. It is effective for weight loss, if that is a concern, and you should see changes fairly quickly. The trampoline, as said earlier, has detachable legs that you will put together. The surface crunches down to a manageable size for transport, so you can open it up and attach it to the legs. The cover for the trampoline is made of perfect for making sure that it's safe and secure as you travel with it. The warranty is (as aforementioned) for one year for the frame and 90 days for the parts. This is a manufacturer's warranty. This trampoline has an easy set up, and though it's said that you might need two people to set it up, if there's just one of you, you can use your body weight to unfold it on your own. This trampoline also bounces really well, and it's neither overly stiff nor overly flexible, so you can make it work just perfectly. There is a chance that, if you jump, you will improve your posture over time. You may also notice that if you jump, your lymph nodes will drain, and you will feel that the trampoline is a good health investment. The rebounding will be a good health investment, and you will also find that the trampoline's low cost and solid use value make it a good choice for many years to come. It also folds down and locks into place with ease, so you'll be very pleased to find that you can set it up and move it around by yourself. If you've been a runner, you may find that your health is better using a trampoline, because runners are prone to get all kinds of joint issues in their knees due to heavy contact with the hard pavement. This trampoline's cover and surface are relatively soft, so you'll be sure to stay in good shape joint-wise. Also, the cover may rip, so keep that in mind (though it is possible that the cover can be fixed with a little home repair knowledge). Also, the trampoline may not be very bouncy, and even though a relatively small person bounces on it, it can lose its bounce fairly quickly. The trampoline may not last much longer than three months. The trampoline also smells a little bit off, and it may contain cancerous agents. Also, there's a chance that the trampoline might come with mold on parts of it (mesh, nuts, bolts). So, as you can see, there are a number of negatives to owning this trampoline. In conclusion, the trampoline gets so many mixed reviews that it's really up to you if you're willing to take a chance. 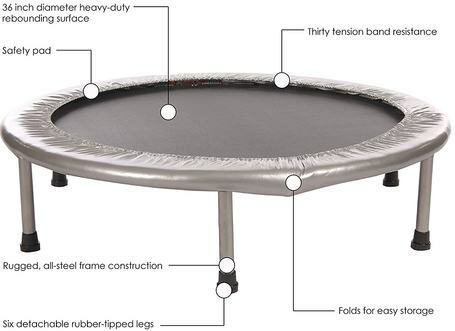 Keep in mind that a good rebounding trampoline will give you the kind of exercise you need, but if you don't want to take a risk on setting up this trampoline (which could be a challenge) and are concerned about the smell or about any of the other things you see listed above, then you may want to look at a different model. In general, trampoline exercise is among the best you can do for yourself, but you will want to purchase a trampoline that offers you everything you need, and your safety and ease of use should always be paramount concerns.